Today, Americans have access to more news than ever, available round-the-clock, delivered through the internet to smartphones and laptops and by cable and satellite to TV sets. Out of the digital deluge of news come up-close-and-personal videos of terrorist attacks, of violence by and to police officers, of full-length speeches by presidential candidates, as well as features on celebrities and how-to advice on every subject imaginable. And yet the digital deluge hardly spills out local news. In states and some larger cities, niche online news organizations have sprung up to fill gaps left by the downsizing of metropolitan newspapers. But for residents in smaller cities and towns, from Goldsboro, North Carolina, to Minot, North Dakota, the internet offers little substantive coverage of events and issues of everyday interest and importance. Unless local newspapers in those communities reconstruct themselves and sustain their coverage online, who will pay attention to the actions of the city council, the success of local schools, or the safety of the town’s water supply? In the 20th century, newspaper publishers used revenue from selling print advertising to pay for public service journalism, the day-to-day reporting and commentary that inform citizens and improve the quality of life in a community. That old model no longer delivers sufficient revenue, and newspaper owners are struggling to come up with a new one. Legacy owners, such as McClatchy and Advance, as well as newcomers, such as New Media/Gatehouse and BH Media, have made painful cuts in expenses. Overall newsroom staffing has fallen below 1970s levels. Even among the surviving newspapers, the editorial scope and influence of newspapers have diminished. Some new media barons — New Media/ GateHouse, Digital First, tronc and 10/13 Communications — have also implemented aggressive digital strategies, aimed at capturing new readers and at opening a wider revenue stream. But in chasing “clicks” and “audiences” to appeal to local advertisers, their cookie- cutter newspaper websites and social media postings supply pithy and entertaining features for “sharing,” “listicles” and the sort of videos ubiquitous on the internet.70 Ultimately, it doesn’t matter whether local news is delivered through ink-on-paper or over a mobile phone. What matters is that a local news organization reports on important issues and provides context and analysis so citizens can make informed decisions and hold their public officials accountable. Unprecedented consolidation in the newspaper industry has placed the fate of local journalism into the hands of fewer companies than ever before. 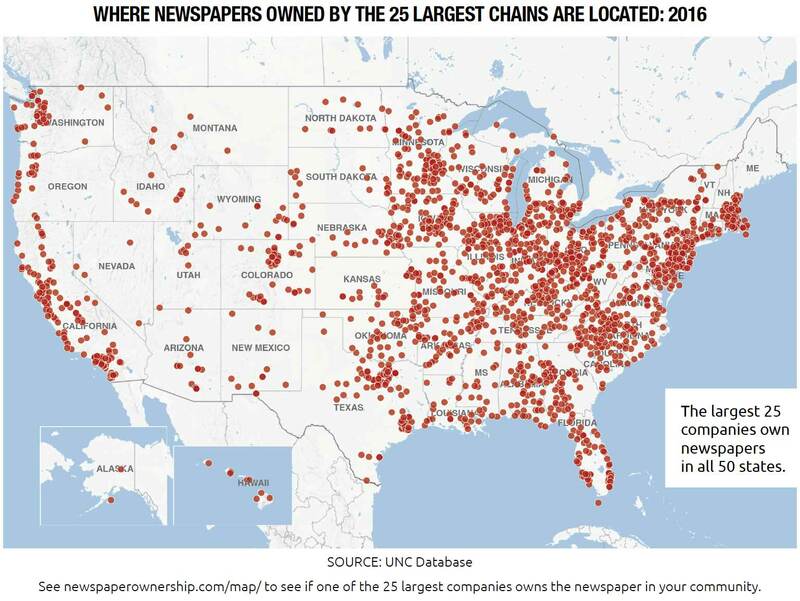 The largest chains have grown so large that they necessarily have less attachment to the communities where they own newspapers than even the barons of previous eras. The rise of the newest media owners, with their emphasis on profit benchmarks instead of civic responsibility, has added a new wrinkle. In the late 19th and early 20th century, many newspapers adopted slogans that touted their public service mission: “All the News That’s Fit to Print” or “The Only Newspaper in the World That Gives a Damn About Yerington (Nevada).” The now-defunct Cleveland Press, which Time magazine identified in 1964 as one of the top 10 local newspapers in America, had a straightforward motto: “The Newspaper That Serves Its Readers.” By contrast, a manager’s manual from the investment firm 10/13 Communications, established in 2009 espouses a different sentiment: “Our customer is the advertiser. Readers are our customers’ customers. [Therefore] we operate with a lean newsroom staff.”71 Over the past decade, investment firms have acquired significantly more newspapers in rural areas or localities with high poverty rates. With regional news outlets — including metro papers and television stations — pulling back coverage from outlying areas, newspapers owned by investment entities are often the only source of local news in many communities. Because they spread risk across multiple products and geographic areas, investment groups can afford to let individual newspapers fail or pursue a harvesting strategy in which they “manage the decline” of the assets in their portfolio. If their newspapers fail, and viable alternatives do not arise, many communities across the country are in danger of becoming news deserts. 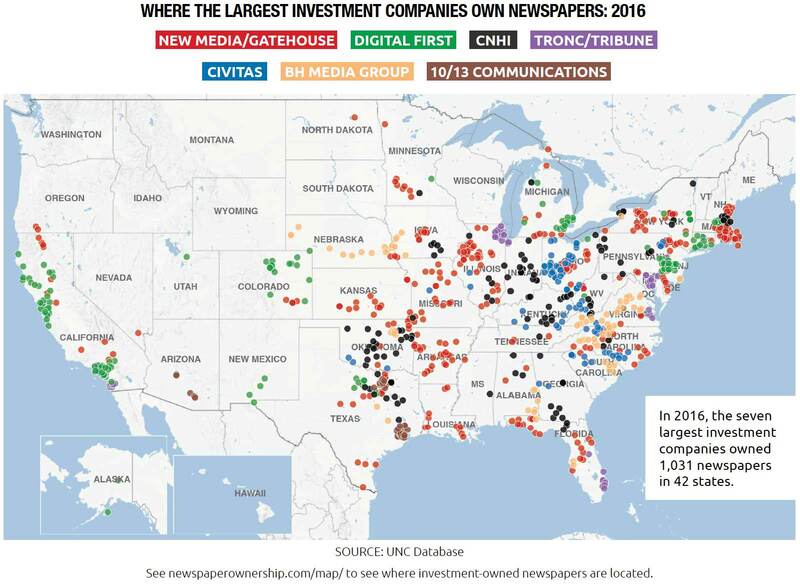 In 2016, the largest 25 companies — seven investment entities, three public companies and 15 private firms — collectively own newspapers in all 50 states. In all but a handful of states, they own the largest two or three dailies, and well as dozens of smaller dailies and weeklies. The large chain-owned papers are concentrated in the eastern half of the U.S. and along the Pacific Coast. Ten less-densely populated states in the Rocky Mountain and Western Great Plains region have fewer newspapers, most owned by smaller, regional private companies. The two largest companies have the biggest national footprint. New Media/GateHouse currently owns 432 local newspapers in 32 states, while Gannett has 258 papers in 34 states. The other large companies have much smaller footprints. Their newspapers tend to cluster in specific geographic regions of the country. Digital First, the third-largest company, owns 208 papers in only 15 states. Similarly, Advance, one of the largest privately owned chains, has 74 papers in 11 states. Over the past decade, the seven largest investment groups vastly extended their reach as they purchased financially troubled legacy companies that came on the market. In 2016, the largest investment firms owned papers in 42 states, up from 27 in 2004. In total, the seven largest investment firms own 14 percent of all newspapers in the country. In a dozen or so states, they own between a fifth to as much as a third of all newspapers. Massachusetts ranks at the top of states with the most papers owned by the large investment entities — 141. After Massachusetts come California (112), Illinois (94), Texas (82), Ohio (74), Pennsylvania (61), New York (42), Florida (40), North Carolina (40) and Oklahoma (35). The large investment firms do not currently own local newspapers in eight states — Hawaii, Idaho, Montana, South Dakota, Vermont, Washington, Wisconsin and Wyoming. However, they do have a presence in several of these states since they also publish regional and statewide business journals and special-interest newspapers and magazines. Click here for a state-by-state listing of the number of papers owned by largest investment firms. Investment groups are most prevalent in New England, the Middle Atlantic, the South and the Pacific Coast regions. New England has experienced rapid growth in the number of papers owned by investment firms. In 2004, there were no investment firms in the region. By 2016, these firms owned 167, or 33 percent of all papers. Investment entities also had a significant presence in the Midwest, with 290 papers, and in the South, where they own 374 papers. New Media/GateHouse has a strong presence in New England, with 137 papers in Massachusetts, clustered in and around the greater Boston area, as well as in Illinois, with 36 papers, and in Ohio, with 30. For the most part, New Media has acquired papers in smaller markets not covered by regional television stations. The 125 daily papers owned by New Media/GateHouse have an average circulation of 14,500, and its nondaily papers have an average of 5,900. Digital First owns 87 papers in the Pacific region, 85 of which are in California, clustered around the Bay Area in the North and around Los Angeles in the South. It also has 47 papers in the Middle Atlantic states, with 38 located in Pennsylvania. Digital First tends to own papers in mid-sized markets located in or near metro areas. The average circulation of its dailies is just under 34,000 and its nondailies, 13,200. Community Newspaper Holdings (CNHI), the pension-fund entity, has 20 newspapers in Oklahoma, 17 in Indiana and 12 in Kentucky. It tends to focus on small markets outside major metro areas. Its dailies have an average circulation of about 10,000 and and its nondailies, 7,500. Civitas papers are clustered in the Midwest and South, including 41 papers in Ohio and 15 in North Carolina. As with CNHI, almost all of Civitas’ papers — whether daily or nondaily — are located in small, rural markets. Its dailies have an average circulation of 9,800 and its nondailies, 6,700.
tronc/Tribune newspapers are located in eight major metro markets in seven states, including California, Illinois and Maryland. Tribune typically owns the major metro daily in each market and in recent years has focused on purchasing weeklies in nearby suburbs. It has 42 papers in Illinois — all in the greater Chicago metro area, 23 in Maryland in the Baltimore and Annapolis areas, and 15 in southern and central Florida, including Orlando and Fort Lauderdale. The average circulation of its 19 dailies is 108,000, and for its 85 weeklies it is 16,200. BH Media papers are clustered in mid-sized markets in the South, including 26 papers in south-central Virginia and 11 in adjacent counties in north-central North Carolina, as well as the Midwest. It has 14 in Nebraska, including Omaha, the flagship paper. Its 32 dailies have an average circulation of 28,700, while its nondailies average 7,900. 10/13 Communications, the newest investment firm, owns 42 weeklies and three dailies — all located in or around Dallas and Houston in Texas and Phoenix and Tucson in Arizona. The average circulation of its papers is 19,000. 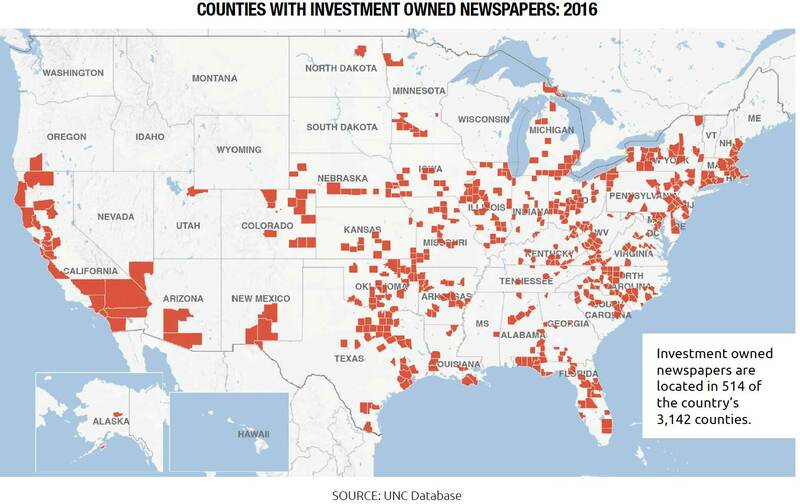 Over the past decade, large investment entities acquired a large number of newspapers in rural communities and/or economically struggling regions of the country. From 2004 to 2016, the big seven acquired 1,004 newspapers — 303 dailies and 701 nondailies. Nearly half of the papers purchased by investment firms had print circulation under 5,000, including a fifth of the dailies. Investment firms acquired twice as many newspapers — 257 — in rural counties than either of large either public or private companies. This report uses the definition of rural in the U.S. Department of Agriculture’s Rural-Urban Continuum Codes. Almost 60 percent of the papers owned by Civitas and CNHI, and 30 percent of the papers owned by BH Media and New Media/GateHouse, serve rural areas. Forty percent — or 410 — of the newspapers purchased by investment firms are located in counties with poverty rates at least 1 percentage point higher than the national rate of 14.8 percent. As a comparison, 217 of the purchases made by the largest 15 private chains and 104 purchases by the three public firms were in economically distressed areas. Between a half and two-thirds of the 340 papers currently owned by BH Media, 10/13, Civitas and CNHI are in counties with above-average poverty rates. About a third of the 753 papers owned by the other three large investment firms are in economically distressed areas. 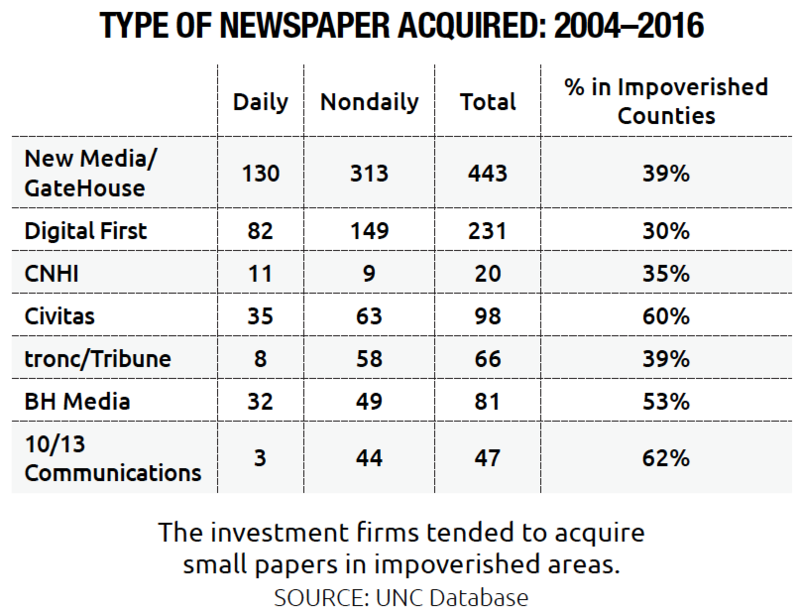 Seventeen percent — or 86 — of the newspapers owned by investment firms in the UNC database appear to be the only newspapers in the county where they are located. This raises the possibility that the lone newspapers in those counties have a de facto monopoly on local advertising, with an ability to set rates and conditions for readers and advertisers. Additionally, they are most likely the prime — if not only — source of local news and information. The strategies that investment companies pursue tend to focus on short-term financial progress, not the long-term civic needs of the communities where their papers are located. In inner cities and rural areas, the community newspaper historically has served as the prime source of reporting and commentary that could inform public policy decision-making. The legacy chains of the late 20th century tended to “buy and hold” properties, and the most civic- minded also invested in aggressive and costly public service journalism.72 The publishers and editors understood that the fortunes of the community and the newspaper were tightly linked. Publishers, even those hired by chain headquarters somewhere else, regularly took on civic engagement activities in the community of the newspaper they led. The largest investment companies bring a different philosophy and day-to-day operational strategy. While the websites of the investment- owned newspapers still stress their civic mission and their aspirations to provide reliable and meaningful information to their communities, the public statements by executives of the large investment firms emphasize business and return on investment. See http://newspaperownership.com/additional-material/ for examples of public statements made by executives on why they purchase newspapers, their stated financial goals and their civic mission. The rapid expansion of investment firms as newspaper owners occurs at the very moment newspapers are struggling to adapt to the digital era, with survival at stake. Advertising revenues, which historically provided more than 80 percent of total revenue for most local newspapers, have fallen to unprecedented levels and continue to decline as local and regional merchants shift spending to digital outlets. long-term strategy requires owners to have faith in the future, an abiding commitment to the overarching mission of the paper and patience with the inevitable monthly and yearly financial fluctuations that come with charting a new direction. Or newspaper owners can manage the decline, harvesting as much revenue as possible — usually by raising the rates charged advertisers and the subscription price to readers, and then either selling, trading or shutting down the newspaper as it becomes less profitable. The investment firms do not air their operational decision-making. The fateful choices they make in the day-to-day management of small papers do not get attention outside the affected communities. Nevertheless, it is possible to identify common trends and strategies from corporate press releases and statements, as well as news accounts published in recent years. Investment firms have tended to pursue strategies that attempt to maintain the status quo and current profit margins — or, alternatively, manage the decline before either selling or shuttering unprofitable papers. A willingness to sell or close underperforming newspapers. Investment firms are continually adjusting their portfolios to maximize financial return. Whenever possible, they attempt to sell or trade their underperforming newspapers to other chains or to local owners. Often the papers are purchased by other investment groups. For example, Heartland Publications, backed by Wachovia Capital Partners, was acquired in 2011 in bankruptcy proceedings by Versa Capital, owner of Civitas. More than 300 papers owned by the largest investment firms have been sold or traded since 2004, according to news accounts and analysis of the UNC database. Relatively few newspapers were sold in the years immediately after the recession of 2008–2009, but sales have picked up since 2013. New Media/GateHouse, CNHI and Digital First have been the most active sellers in recent years. In the first week of August 2016, New Media/GateHouse, for example, sold 12 of its Illinois papers to Paddock Publishing at the same time it purchased The Fayetteville (North Carolina) Observer. The turnover in staff that often occurs with the buying and flipping of properties erodes the connection of a local newspaper to the community. But at least there is still a newspaper. When no buyer can be found, investment entities are willing to close local newspapers. The largest investment firms have closed or merged at least 85 newspapers, including 22 dailies, in the UNC database since 2004. New Media/GateHouse has closed or merged at least 40 papers and CNHI, 24. Since 2011, when Digital First, Civitas and BH Media were formed, these three investment firms have closed or merged 22 of their newspapers, including six dailies. The closed and merged dailies have had circulations ranging from 8,000 — the Kansas City Kansan, owned by New Media/GateHouse — to about 100,000 — the four San Francisco-area newspapers owned by Digital First that were merged to form the East Bay Times and South Bay Times. While the websites of many newspapers owned by investment firms profess a commitment to “serving the community” through their journalism, their parent owners do not typically highlight this in their shareholder letters or public statements, instead emphasizing that they have moved quickly to “streamline” operations. Cost-cutting takes a variety of forms, including layoff of staff, wage freezes that extend for five or more years, unpaid furloughs and consolidation of news, advertising and circulation functions into regional centers that serve several papers. According to press accounts and various blogs, newspapers purchased by investment firms have experienced layoffs of between 10 and 40 percent of staff. In some cases, newspapers had already cut staff before the purchase by investment firms. As part of an effort to save $100 million in costs, Digital First closed Thunderdome, an all-digital national newsroom established in 2013 to produce content for its 75 daily newspapers. Less emphasis on expensive public service and accountability journalism. In newsrooms with diminished staffing and often low morale, editors have to make day-to-day judgments about how to deploy limited resources. Do reporters cover stories that will “trend” and “engage readers” — as executives at New Media, Digital First and Tribune expect — or spend time on complex, time-consuming reporting that may or may not bear fruit? Do newspapers publish stories that may result in lawsuits and legal fees that diminish profits? Even if they receive the green light from corporate headquarters, editors still must be selective about which stories their staffs ultimately pursue. With fewer reporters, these papers pursue fewer complicated stories. At the daily papers owned by Civitas, average circulation of 9,800, the one or two reporters only have time to focus on coverage of meetings and larger events in the community. When a major issue surfaces — typically at a city council or county commissioner meeting — there is rarely an editorial that advocates or takes a stand. In the space typically devoted to staff-written editorials, Civitas prints “letters to the editor,” including the weekly constituent letters from the district’s congressman. An examination of the media landscapes in Massachusetts, Illinois, Ohio, North Carolina, Kentucky, and West Virginia offers insight into where and how ownership of newspapers has shifted dramatically over the past decade. And these six state profiles suggest the potential for news deserts to emerge in hard-hit rural and low-income regions of the country. Each of these states has regions tied to declining manufacturing, mining and farming. Illinois, Ohio and North Carolina rank among the 10 most populous states. Still, more than half of their counties are classified by the U.S. Department of Agriculture as rural, many of them dealing with above-average unemployment, above-average poverty rates, an aging population, as well as health care and education issues. Regions of Kentucky and West Virginia, especially where investment firms own most or all of the papers, have some of the highest rates of poverty and unemployment in the country. Kentucky, West Virginia and Ohio are also faced with mounting environmental and ecological issues. In Massachusetts, investment firms own two- thirds of all newspapers in the state. In the other five states, they now control at least a fifth of all papers. The communities in these states need their newspapers to provide the sort of public service journalism that can document and help identify solutions to their most pressing problems. Newspaper Ownership: Of 226 papers in the state, 141 are owned by three investment entities, all purchased since 2004 and largely clustered in the greater Boston metro area and on Cape Cod. By far, the dominant player in this market is New Media/GateHouse, which owns 126 papers (nine dailies and 117 nondailies), or 56 percent of the papers in the entire state and more than two-thirds of the papers in the populous eastern region. Community Newspaper Holdings (CNHI) entered the state first by purchasing 10 papers in the northern Boston suburbs in 2005 from the privately held Eagle Tribune Publishing Co., headquartered in North Andover. In 2006, the New Media/GateHouse enterprise, which had just been acquired by Fortress Investment Group, bought 126 small nondaily papers in the Boston area from Community Newspaper Co. (not the same as CNHI) and rebranded these as WickedLocal. 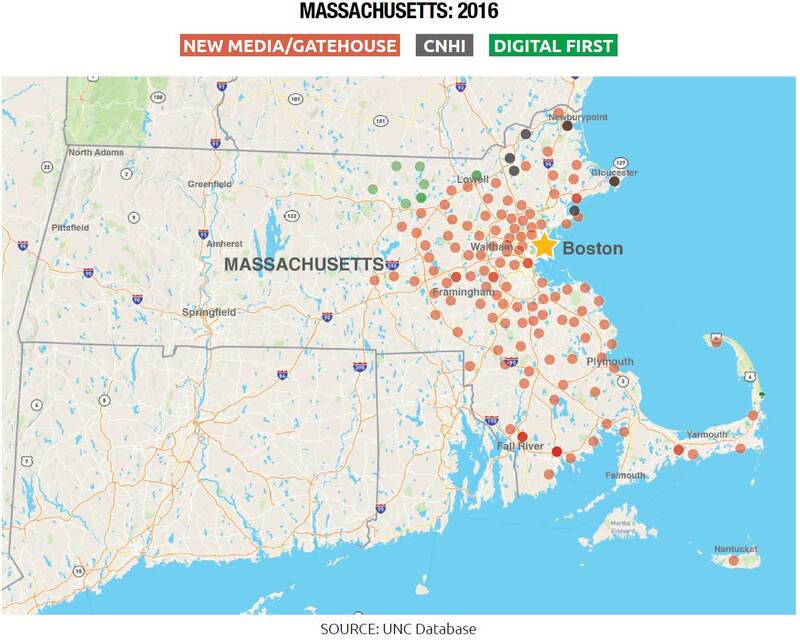 Digital First entered the state last in 2011 when it purchased the MediaNews chain in bankruptcy proceedings and acquired 11 newspapers in Massachusetts, including a daily in Lowell, northwest of Boston, and two other dailies in the middle of the state. Since 2006, New Media/GateHouse has added to its Massachusetts empire by buying 13 newspapers from Enterprise News Media and five from the Dow Jones Local Media Group. Most recently, it acquired the Telegram & Gazette in Worcester, with 68,000 circulation, the third-largest daily in the state behind The Boston Globe and Boston Herald. The Worcester paper has changed ownership four times since 2013, when The New York Times Co. sold it to John Henry, owner of the Boston Red Sox, who then flipped it to Halifax Media. New Media then acquired the Halifax chain in 2015. While New Media’s reach in the Boston metro area has extended significantly in recent years, the circulation of The Boston Globe has dropped. Since 2004, weekday circulation of The Globe, which The New York Times Co. in 2013 sold to John Henry, has declined to 230,000 in 2016, from 450,000. As a result, the combined 235,000 circulation of the nine dailies owned by New Media is comparable to that of the weekday Globe. And the total 629,000 circulation of all New Media papers — including 117 weeklies — is significantly more than the 365,000 Sunday circulation of The Globe. Looking Ahead: The greater Boston market is now virtually divided between two newspaper companies. The Boston Globe owns the city and the greater metro area on a daily basis while New Media/ GateHouse owns the suburbs with its collection of weeklies. The Globe can cover the major news that affects the region and provide context and analysis on statewide issues. But it doesn’t have the reporting staff to cover the very local issues and concerns in each of its many suburbs. That responsibility falls to the editors of the weeklies owned by New Media/GateHouse. Yet the CEO of New Media has indicated the company’s “mapping strategy” prioritizes the needs of the advertisers, not readers. When New Media/GateHouse shut down 10 Boston area weeklies in 2013, CEO Davis noted that the company was “shifting resources” to communities that local advertisers wanted to reach.89 At the same time New Media continues to streamline and consolidate its news operations, leaving some of its communities to be covered by reporters from remote locations. In March 2016, GateHouse closed the Somerville newsroom, which was home to the Cambridge Chronicle and the Somerville Journal, and laid off the managing editor of the Boston-area newspapers. The 170-year-old Chronicle, the country’s oldest continually published weekly, is now run out of the Lexington office, 22 miles away.90 In a metro area as large and populated as Boston, the absence of reporters in the communities such as Cambridge suggests that many important stories will remain uncovered and unwritten. State Overview: Illinois is the fifth-most-populous state, with 12.8 million people, yet, 62 of its 102 counties are classified as rural. Twenty-four of those counties have above-average rates of poverty. The state unemployment rate averaged 6.2 percent, compared with the national average of 4.9 in June 2016. Unemployment remains as high as 10 percent in some southern and western counties. Chicago’s Cook County, with a poverty rate of 17.1 percent, has one of the highest violent crime rates in the country. Like Massachusetts, Illinois has projected short-term and long-term budget shortfalls, related to state pension and debt obligations. There are currently major political debates around proposals to raise property taxes in the wealthier Chicago suburbs and to open up more areas in the state for gambling and casinos. 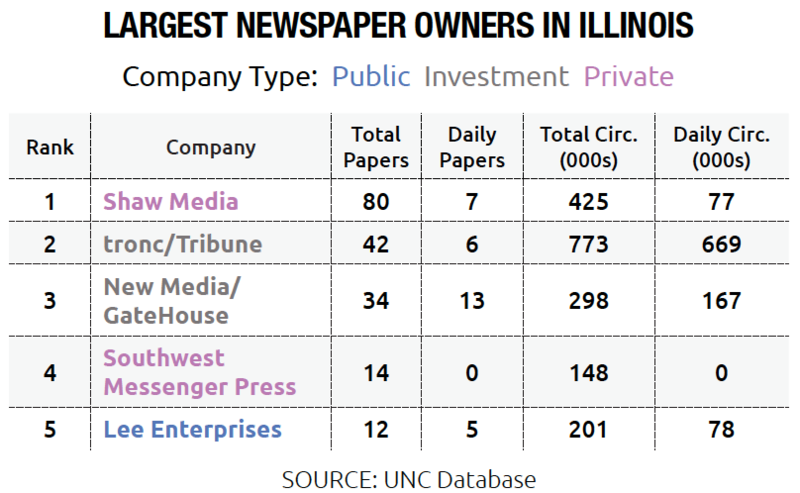 Newspaper Ownership: Investment firms own 83 of the 477 newspapers in the state and control circulation of 1.1 million, 25 percent of total printcirculation in Illinois. Investment firms staked out a presence earlier in Illinois than in most other states. In 1998, Leonard Green & Partners LP, a Los Angeles-based private equity firm, financed Liberty Publishing Group’s purchase of 160 small papers in the upper Midwest from Hollinger International, including 70 in Illinois. Based in the Chicago suburb of Downers Grove, Liberty Publishing rapidly added to its holdings, doubling in size before downsizing to 250 papers in 2005, when it was purchased for $527 million by the New York-based private equity company Fortress Investment Group.91 Fortress moved the headquarters to New York and renamed the company GateHouse. Since filing for bankruptcy reorganization in 2013, GateHouse is now known as New Media. Today, New Media, which owns more than 400 papers in 32 states, and tronc/Tribune, which was sold to a private equity firm in 2007, are the two dominant newspaper-owning investment firms in Illinois. In the past four years, a significant realignment of newspaper ownership has taken place in the greater Chicago metro area, with a population of 9.5 million. Four major owners — New Media, Tronc/Tribune, Shaw Media and the Sun-Times — have either purchased or divested assets. In 2012, New Media retreated entirely from the Chicago market, selling all its suburban weeklies to the private, family-owned Shaw Media Co., founded in 1851. As a result, Shaw, which is based in the Chicago suburb of Dixon and owns 80 newspapers, became the dominant media provider in the outer western suburbs, with a total circulation in the greater metro area of 436,000. Two years after Shaw purchased the suburban papers from New Media, the Tribune Publishing Co. acquired from the Chicago Sun-Times 36 papers — four dailies and 32 weeklies — located in four counties of the inner Chicago metro area: Cook, Lake, DuPage and Kane. In purchasing these suburban papers, the Tribune Co. positioned itself to provide print and digital marketing services to local and national advertisers who want to reach either the entire metro area or to target specific suburban communities. As a press release put it, the company’s footprint spans “from Waukegan [in the north] to northwest Indiana” in the south.92 The combined daily and weekly circulation of 773,000 of the Tribune papers is greater than any other publication in Illinois and dwarfs the Sun-Times’ circulation of 210,000. 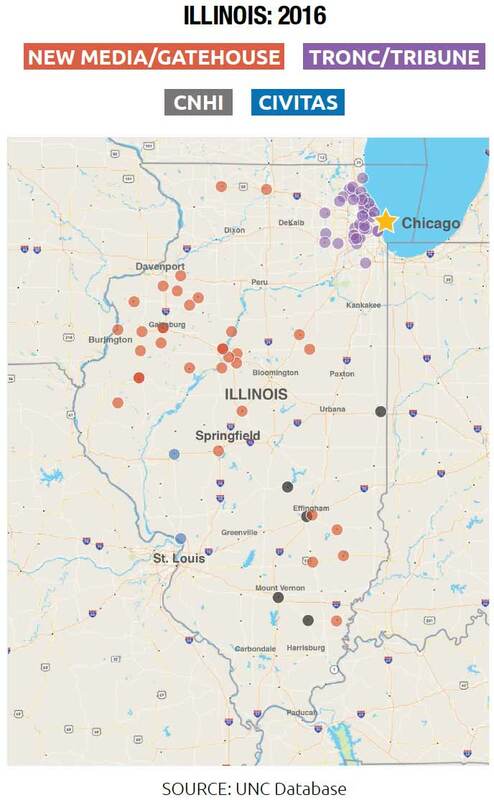 With the greater Chicago market split for the moment between Shaw and tronc/Tribune, New Media has focused its attention on its other newspapers, most of which are in rural southern and western Illinois. In August 2016, it sold 11 papers, including five dailies, in southern counties to the privately owned Paddock Publications. New Media now owns only 34 papers, including 13 dailies, most clustered in rural western and central Illinois. This includes the three largest dailies outside Chicago: the Peoria Journal Star, with circulation 58,500; the Rockford Register Star, with 53,500; and The State Journal-Register in Springfield, with 44,000. Most of the other 33 New Media papers are under 10,000 circulation. Seven of the 22 counties in which New Media now owns a paper — including the three where the large dailies are located — have above-average poverty and unemployment rates. In nine of the state’s counties, New Media owns all the papers, making it the sole provider of local news and advertising. State Overview: Ohio is the seventh-most-populous state, with 11.6 million people. Of its 143 counties, 84 are rural, and 39 have poverty rates above the national average. In recent times, it has been a bellwether “swing state” in presidential elections. Currently, the most animated debates on public policy in Ohio revolve around drug addiction and crime, the quality of public education, taxation as it relates to economic development, and fracking regulations and pollution of the Great Lakes.94 Ohio is also one of the older-population states, with a median age of almost 40. Press releases issued by New Media when it purchased the Columbus and Providence papers note that both cities are “capitals of government and commerce,” and, as such, are “attractive regional advertising markets.” With the addition of the Columbus daily and the 24 weeklies owned by the Dispatch Co., New Media has circulation of 472,000 in Ohio, compared with the 594,000 circulation of Advance Publications, which owns the state’s largest newspaper, The Plain Dealer in Cleveland, as well as 12 other newspapers in the state. In central and eastern Ohio, New Media has a largely uncontested claim on an attractive regional advertising market that, for the most part, enjoys below-average rates of poverty and unemployment. Versa Capital Management, a Pennsylvania- based private equity firm, entered the Ohio market in 2011, purchasing 44 papers from Ohio Community Media, a holding company formed by creditors of Brown Publishing, a 90-year-old private, family-operated chain of small dailies and weeklies, based in Cincinnati, that had filed for bankruptcy.98 In 2012, Versa added to its Ohio holdings by purchasing The Lima News from Freedom Communications and acquired Heartland Publications, a bankrupt newspaper chain located in the Southern states. Versa merged its two newspaper groups to form Civitas. After selling three papers and closing four others in 2014, the Civitas group owns papers in 22 counties in Ohio, mostly clustered in the less populated counties in the west, northwest and southeast. Twenty-nine of its remai ning 41 newspapers have circulation below 10,000. Only five are above 20,000, and only three are dailies. They include the Community Common in Portsmouth, with a circulation of 35,000. The Community Common is located in Scioto County, population 80,000, on the Ohio River border with Kentucky, and has a poverty rate of 24.8 percent. Thirteen of the papers owned by Civitas are in counties with unemployment and poverty rates considerably above both the state and national rates. Civitas owns the only newspapers serving four of those economically struggling counties. 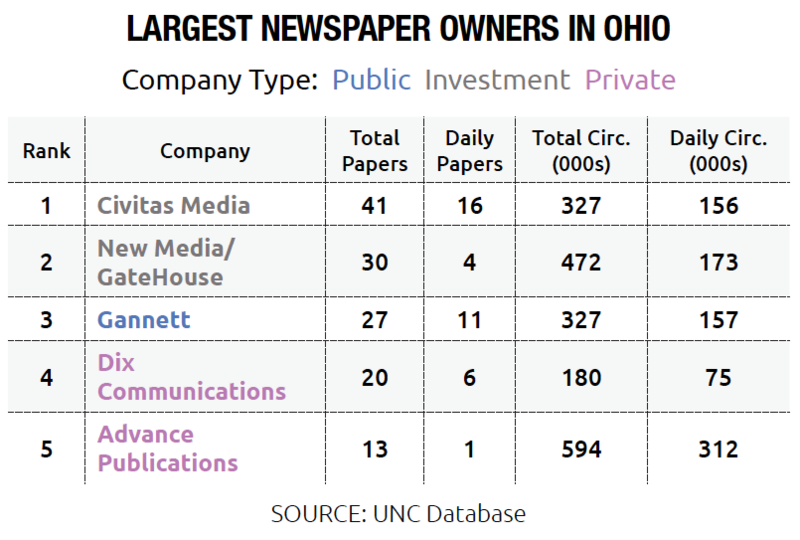 Looking Ahead: Investment firms own a quarter of all newspapers in Ohio. Still, other large public (Gannett) and private (Advance) chains also have a significant presence. Most of the major markets in the state are relatively self-contained, with very little competition from other newspapers — Advance in the Cleveland metro area, Gannett in Cincinnati, and New Media in Columbus. But while newspaper ownership in the metro areas appears relatively stable for now, the future of the newspapers in rural Ohio is less certain. Since 2012, Civitas (aka Versa) has closed three “underperforming” weeklies and one daily in four Ohio communities that were struggling economically — and no other news organization has stepped in to fill the void. Newspaper Overview: Investment firms own 40 of 185 papers and control 20 percent of the total circulation of 2.4 million. The two largest daily newspapers — The Charlotte Observer, with 107,000 circulation, and The News & Observer in Raleigh, with 94,000 circulation — are owned by McClatchy. The next four largest dailies in the state are owned by BH Media and New Media/GateHouse. BH Media, a division of Berkshire Hathaway, owns the Winston-Salem Journal, with 60,000 circulation, and the News & Record in Greensboro, with 46,500 circulation, in the middle of the state. New Media/GateHouse owns The Fayetteville Observer, with 37,000 circulation, and the Star-News in Wilmington, with 36,000 circulation in the southeastern part of the state. These three investment firms have also acquired newspapers in counties with significantly above- average poverty rates. Civitas owns papers in nine of the poorest counties in the state, including three in the northwest and six along the U.S. 74 corridor in the southeast. In eight of those counties, Civitas is the sole newspaper proprietor. It has only two North Carolina newspapers with a circulation of more than 10,000: The Robesonian in Lumberton, with 10,800, and the Mount Airy News, with 10 ,620. Robeson County has a poverty rate of 33.1 percent, and Surry County, home of Mount Airy, has a poverty rate of 18.8 percent, both significantly above the 14.8 national average. BH Media’s 11 papers are in north-central North Carolina near Interstate 40. Eight are located in counties with above-average poverty rates, and in two of those counties, the firm owns all the area newspapers. New Media/GateHouse owns a collection of papers clustered mostly in the southeastern part of the state, stretching from Fayetteville to the coast, and along I-85 in the central part of the state. Nine of the 11 counties in which New Media owns papers have above- average poverty rates. Looking Ahead: Because they are relatively new to the state, it is too early to know whether BH Media, New Media/GateHouse and Civitas are “here to stay” in North Carolina or merely passing through. Warren Buffett is retiring as head of Berkshire Hathaway, and it’s unknown whether his successors will match his interest in newspapers.103 Over the last decade, New Media has continually adjusted its portfolio as it seeks to build regional advertising markets around its newspapers. With its purchase of the Fayetteville paper, New Media appears to be solidifying its hold on the southeastern portion of state. The five small papers in the central part of the state may not align with their regional advertising strategy and therefore might end up shut down or traded, most likely to either BH Media or Civitas, which already own papers in that area. Newspaper Overview: The percentage of newspapers owned by investment entities in Kentucky is a relatively low 12 percent. However, in the eastern counties of Kentucky and the adjoining southwestern portion of West Virginia, investment firms own more than half of 44 papers in those counties, some of the poorest in both states. In fact, all of the 35 papers in Kentucky and West Virginia owned by investment companies are located in counties with above-average poverty rates. Community Newspaper Holdings owns 18 papers in the two states — 12 in Kentucky, six in West Virginia. These were among the first papers acquired by CNHI when it was formed by the Retirement Systems of Alabama in the late 1990 s. Only four of the papers owned by CNHI have circulation above 10,000 — the largest being The Register-Herald in Beckley, West Virginia, with just over 20,000 in circulation. Civitas acquired six papers in each state when it purchased the bankrupt Heartland Publications chain in 2012. All 12 papers owned by Civitas have circulation under 10,000. 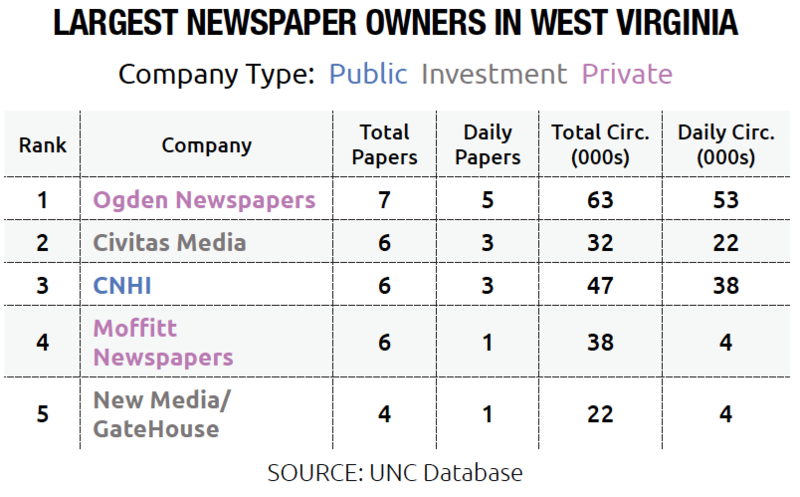 During the last decade, New Media/GateHouse also acquired four small West Virginia papers, all below 10,000 in circulation. The three major regional papers in the two states have little readership in the areas where Civitas and CNHI own papers. The circulation of the Gannett- owned Louisville (Kentucky) Courier-Journal, the largest paper in either state, has dropped to 89,000 in 2016 from 207,000 in 2004. The McClatchy- owned Lexington Herald-Leader has dropped to 74,000 in circulation from 114,000. The Charleston (West Virginia) Gazette-Mail’s circulation of 46,000 is predominantly in the metro area. In 18 of the 25 rural counties in which they have a presence, Civitas and CNHI own all the newspapers. 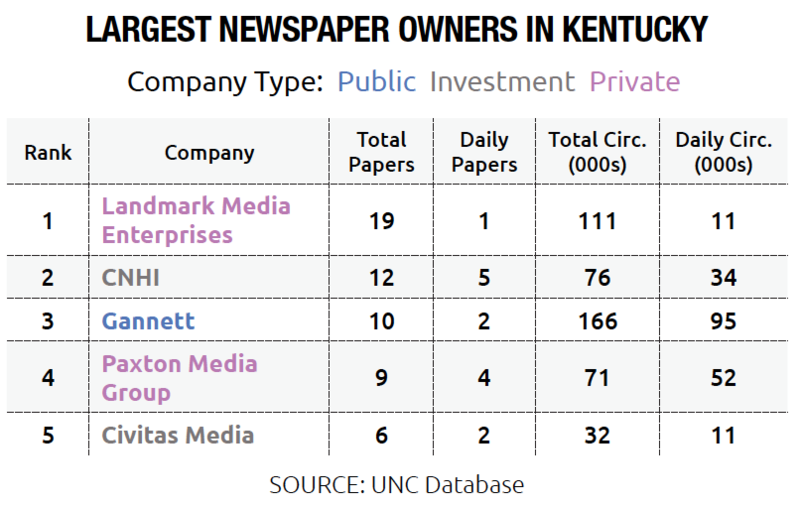 Looking Ahead: Privately held Landmark Media Enterprises, which owns 19 community papers in Kentucky, is the largest newspaper owner in the state. Since 2008, Landmark has sold off its Greensboro (North Carolina) News & Record and Roanoke (Virginia) papers to BH Media and its Annapolis (Maryland) paper to Tribune. Landmark has indicated that it intends to sell all its newspapers. If Landmark’s Kentucky newspapers attract investment firms, the number of papers owned by investment firms would rise significantly. Conversely, CNHI, Civitas and New Media could decide to exit. Since 2012, those three firms have been among the most aggressive in shutting down and selling underperforming papers. In either scenario, the newspaper landscape in Kentucky and West Virginia likely will change dramatically in the near future — and the communities that will be most affected are the poorest. The futures of newspapers owned by investment firms and the communities that these papers serve are inextricably linked. Both newspapers and rural communities and struggling to adapt technologically and financially to macro-economic change and the digital era. If the local newspaper fails, no other medium, such as television or radio, is capable of providing these communities with the sort of public service journalism that lays out the issues and holds public servants accountable. Extensive research has found that local newspapers, more than any other medium, have an important agenda-setting function. They have the ability to shed light on community needs, to determine the major issues debated by citizens and to help point a community toward decisions on public policies.105 By reporting important stories and giving prominence to them, editors and publishers of local papers set the agenda and contribute to the quality of life in their communities. Historically, many papers have also followed their reporting with editorials that argue for specific courses of action. According to some estimates, newspapers provide as much as 85 percent of “the news that feeds democracy” at the local, state and national levels.106 Without investment in journalism and digital technologies, the ability of local newspapers to survive as a credible voice for their communities in the 21st century is threatened. Regional or Metro Newspapers: Several Pulitzer Prizes won by large daily papers in the latter half of the 20th century focused on regional issues that affected rural residents. The News & Observer of Raleigh, North Carolina, for example, received the Pulitzer Public Service award in 1996 for its series on industrial hog farming in eastern North Carolina. Since 2000, however, newsroom staffing across the country has dropped by almost 40 percent.108 Some papers, like The News & Observer, which is owned by the McClatchy Co., have retained a corps of investigative reporters, but there is ample documentation of a dramatic drop in coverage of city halls and statehouses. As advertising revenue plummeted, many metro papers pulled back distribution from outlying regions. Consequently, circulation of most large regional newspapers has declined 42 percent. With fewer reporters covering statewide or regional beats and fewer readers in outlying areas, metro papers give much less attention to issues uniquely affecting rural counties, many of which are struggling economically. Regional Television Stations: Even though TV stations have expanded the daily time allotted to local news in many markets, the preponderance of those newscasts revolves around “soft” features, crime, human interest stories, weather, sports and scheduled events. The FCC report found that only 10 percent of airtime — under two and a half minutes — on an evening news show is typically devoted to discussing statewide and regional issues such as health care and education.109 A 2009 study of a Los Angeles TV station found that, on average, only slightly more than one minute of a 30-minute evening broadcast covered local issues such as education, environment, health and transportation.110 Most television stations, unlike newspapers, do not have an editorial voice that commands community attention. With few exceptions, regional television stations have fewer reporters than the dominant newspaper in the market. As a result, coverage beyond the core metro market is usually limited to the weather forecast, tornadoes, hurricanes and major accidents. Radio: Fewer than 40 percent of U.S. residents live where they can receive all-news radio. While National Public Radio covers national, international and regional news, relatively few public radio stations provide extensive local reporting in small and mid-sized markets. Only 60 percent of commercial radio stations have even 30 minutes of local news a day, and this “newscast” often consists of a listing of upcoming events, along with an interview with a local official or celebrity. More than a fifth of all commercial radio stations have no local news at all. Nonprofit News Organizations: Nonprofit news organizations have arisen as alternative sources of news that can potentially fill the gap created as local newspapers shrink. 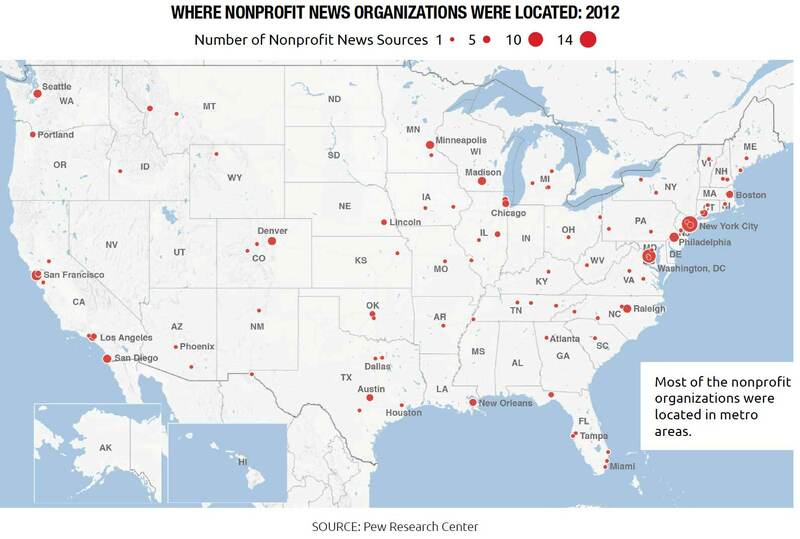 However, most nonprofit news organizations are located in metropolitan areas, and many are primarily online at a time when as many as half of residents in rural communities still lack reliable access to broadband or wireless services.111 Of 172 nonprofit news outlets surveyed by the Pew Research Center in 2012, 101 focused on global, national or state news, and another 49 focused on metropolitan news.112 Of the 13 hyperlocal sites, all but two were in large cities. Start-up nonprofit organizations also face their own financial challenges. A 2015 Knight Foundation survey of 20 organizations concluded that only a handful were on solid financial footing. The average nonprofit relied on support from philanthropic foundations for almost 60 percent of its annual operating budget. Only 20 percent came from earned income, such as sponsorships or advertising. Only six of the nonprofits had an annual surplus that could be tapped for emergencies. The local newspaper has historically served as the primary, if not sole, source of credible news in many small and mid-sized communities. Without a local newspaper, a community loses its voice. The prospect of news deserts emerging in regions throughout the country would have long-term consequences for society. A century ago, when Scripps and Hearst were assembling the first newspaper chains, more than nine out of 10 papers in the U.S. were independently owned and operated.113 By 2000, nine out of 10 papers were links in a media chain. Throughout the 20th century, media critics raised concerns about the fiduciary responsibility of nonresident newspaper owners to the communities where their papers were located. Now, the rapid rise in newspapers owned by large investment companies poses a special set of issues in the digital age. The late 20th century chain had to be attentive to shareholder needs and balance them against community needs. However, since most newspapers before 2008 sold for between 11 and 13 times yearly earnings, chain owners had a strong financial incentive to take a long-term view on investment and hold onto a paper for at least a decade and a half.114 Additionally, publicly held companies, such as McClatchy and Gannett, are required to file financial information with government agencies, guaranteeing a certain level of transparency about management’s decisions. Diligent shareholders can make informed investment decisions based on a newspaper management’s “guidance” on its journalistic priorities and earnings expectations. Unlike the publicly traded chains, investment groups can operate with almost no financial or management transparency. Nor do they automatically have a long-term commitment to a newspaper they have purchased. Investment firms have indicated they will sell or shut down underperforming or unprofitable papers without regard to the void left in the communities where the papers are located. As the number of papers they own balloons, they become more and more removed from the hundreds of communities in 42 states where they own papers. Taken together, these factors make it difficult for readers, advertisers and community leaders to hold the owners of their local paper accountable for the quality and quantity of news and information. Low-income and rural communities need strong newspapers to give voice to their interests and concerns, provide context and analysis around problems and solutions, and help set the agenda for debate and adoption of effective public policies. Television and radio offer little more than spotty coverage; their intermittent attention does not make them a reliable alternative news sources for people in rural and low-income areas. Without a local paper, there is a strong risk of news deserts emerging across vast regions in the country with communities that can least afford it — with political, economic and social consequences for society as a whole. 71 “Thirteenth Street Media Managers’ Guide,” Scribd, 2007, [LINK]. 72 James T. Hamilton, “Subsidizing the Watchdog: What would it Cost to Support Investigative Journalism at a Large Metropolitan Daily Newspaper?” Duke Conference on Nonprofit Media, May 4-5, 2009, [LINK]. 74 Andrew Beaujon, “Warren Buffett expects his papers to deliver 10 percent returns,” Pointer, May 06, 2013, [LINK]. 75 Michael Bush, Gene Hall, Bruce Buchanan, Jeff Brown and Pat Talamantes, “Executive roundtable: Building value in changing times,” Dirks, Van Essen & Murray, December 31, 2012, [LINK]. 76 Ken Doctor, “Newsonomics: Digital First Media’s upcoming sale is producing some surprises,” Nieman Lab, January 15, 2015, [LINK]. 77 James Warren, “Tribune Publishing Combines Editor and Publisher Jobs in Major Shakeup,” Poynter, March 2, 2016, [LINK]. 78 “Thirteenth Street Media Managers’ Guide,” Scribd, 2007, [LINK]. 79 Brad Badertscher, Dan Givoly, Sharon Katz and Hanna Lee, “Private Ownership and the Cost of Debt: Evidence from the Bond Market,” Columbia Business School, January 15, 2015, [LINK]. 80 Jon Chesto, “GateHouse Media’s growth bucks the trend,” Boston Globe, March 11, 2015, [LINK]. 81 Tanzina Vega, “Online Ambitions, and a Dash of Real Estate, Drive Newspaper Deals,” The New York Times, January 29, 2012, [LINK]. 82 “Civitas Media CEO Announces He is Stepping down,” Business Wire, October 9, 2014, [LINK]. 83 “Our Core Values,” Center for News and Design, [LINK]. 84 Kristen Hare, “1 year after Project Thunderdome closed, most former staff have pretty great jobs. Here’s why,” Poynter, April 17, 2015, [LINK]. 85 Michael Barthel, “Newspapers: Fact Sheet,” Pew Research Center, June 15, 2016, [LINK]. 86 “The 50 State Project,” CQ Roll Call, July 28, 2015, [LINK]. 87 Eileen Norcross and Olivia Gonzalez. “Ranking the States by Fiscal Condition,” Mercatus Center at George Mason University, Arlington, Virginia, March 2015, [LINK]. 90 David Harris, “Gatehouse shakeup forces Boston-area newsroom closure, cuts,” Boston Business Journal, March 17, 2016, [LINK]. 91 Dennis Berman, “Fortress Capital Will Buy Publisher Liberty Group,” Wall Street Journal, May 11, 2005, [LINK]. 92 Robert Channick, “Tribune Publishing completes purchase of Sun-Times suburban properties,” Chicago Tribune, October 31, 2014, [LINK]. 95 “GateHouse Completes $380 Million Purchase of Copley Midwest Papers,” Editor & Publisher, April 11, 2007, [LINK]. 96 “GateHouse Media officially done with bankruptcy,” Democrat & Chronicle, November 26, 2013, [LINK]. 97 Tom Knox, “Columbus Dispatch sale finalized; sold for $1 million more than Providence Journal,” Columbus Business First, June 15, 2015, [LINK]. 98 “Brown becomes Ohio Community Media,” Dirks, Van Essen, & Murray, September 30, 2010, [LINK]. 100 “Media General Announces Agreements with Berkshire Hathaway for Purchase of Newspapers and New Financing,” Media General, May 17, 2012, [LINK]. 101 “Halifax Media Group, owner of StarNews, acquired by New Media,” Star News Online, November 20, 2014, [LINK]. 103 Anupreeta Das, “A Potential Warren Buffett Successor Gets More Duties at Berkshire,” Wall Street Journal, April 12, 2016, [LINK]. 106 Jones, Losing the News, 4. Federal Communications Commission, July 2011, [LINK]. 110 Martin Kaplan and Matthew Hale, “Local TV News in the Los Angeles Media Market: Are Stations Serving the Public Interest?” The Norman Lear Center, University of Southern California Annenberg School for Communication & Journalism, March 11, 2010, [LINK]. 111 “2015 Broadband Progress Report,” Federal Communications Commission, February 04, 2015, [LINK]. 112 Amy Mitchell, Mark Jurkowitz, Jesse Holcomb, Jodi Enda and Monica Anderson, “Nonprofit journalism: A Growing but Fragile Part of the U.S. News System,” Pew Research Center, June 10, 2013, [LINK]. 113 David Demers, The Menace of the Corporate Newspaper: Fact or Fiction (Ames: Iowa State University Press, 1996), 46. 114 Ken Doctor, “The great devaluation of the American daily newspaper,” Politico, May 19, 2015, [LINK].